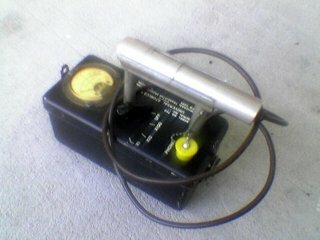 The DRSB-88 is a very compact Radiation Detector Made in Russia. I purchased it on eBay. (Link Below.) After reading a nice review of another model, (Link Below) and finding no other information about such devices elsewhere, I decided to write a review of my own. The unit is one of the the smallest (and least expensive) true Geiger Counters I have ever seen. Update: There are several "Keychain" detectors now available. To read a review of one of them, see the links section at the bottom of the page. What I wanted was something small and easy to carry. The obvious device for such a purpose is a Dosimeter. I am very glad I got a true Geiger Counter instead. What's the difference? See Link Below. 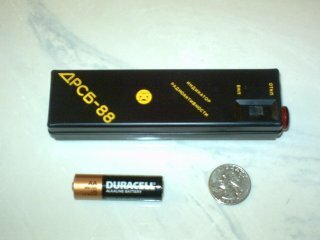 The DRSB-88 is almost as small as a Dosimeter, yet uses a common, easily replaceable battery (One AA Battery.) This may be very important in a Civil Defense emergency. Instead of estimating dose, the DRSB-88 gives indications of individual counts. Background counts soon give assurance that the device is working properly each time you turn it on. It also seems that the battery life is very good. While somewhat privative in construction compared to most consumer electronics, it seems fairly sturdy. I have already dropped mine twice from my shirt pocket onto a tile floor, and it is still working fine. The unit lacks any sort of readout or meter. It's output is simply a light and a clicker. In the presence of a significant threat, the rather bright light would flash enough to be very obvious. The “click” sound is exactly what people expect from a Geiger Counter. If I am near anything that produces anything noticably more than background counts, I am going to take steps to increase the distance between myself and whatever it is as soon as possible. I'll leave the Milliroentgens, Radiation Absorbed Doses (RADs), and Exposure Limit Charts to the proper authorities. If you want to quantify what you detect, the DRSB-88 and a stopwatch will give counts per minute (CPM). By the way, does any body know what exactly that light is? It does not look like an LED. Is it some sort of neon bulb? Sensitivity: With no readout or meter, speaking of “accuracy” is irrelevant. An important thing to note is that the GM (Geiger-Muller) tube in the DRSB-88 is very small. Because of this, fewer ionizing particles are going to pass through it than would pass though a larger tube. My DRSB-88 seems to detect about ¼ the counts as my old Universal Atomics V-700 Commercial Meter. This does not mean the DRSB-88 is inaccurate or not sensitive. 10 times background still means 10 times background, and that means you have a problem. Dr. Covington asked the rhetorical question: Have I found anything radioactive? He did, and So have I. I have a clock out of the instrument panel of an old aircraft. It has a radon dial, and it makes the DRSB-88 go crazy. IF YOU HAVE SOMETHING THAT YOU THINK IS RADIOACTIVE, OR OTHERWISE HAZARDOUS, OR IF YOU SUSPECT OTHERS OF HAVING SUCH, CONTACT YOUR LOCAL POLICE. THIS QUIDE IS A TECHNICAL DESCRIPTION OF CONSUMER ELECTRONIC DEVICES ONLY, IT DOES NOT, NOR DOES IT PORPORT TO GIVE MEDICAL OR ANY FORM OF HEALTH ADVICE. IF YOU SUSPECT THAT YOU HAVE BEEN EXPOSED TO A HAZARDOUS SUBSTANCE, OR ARE HAVING HEALTH PROBLEMS, CONTACT A PHYSICIAN OR YOUR LOCAL EMERGENCY SEVICES.